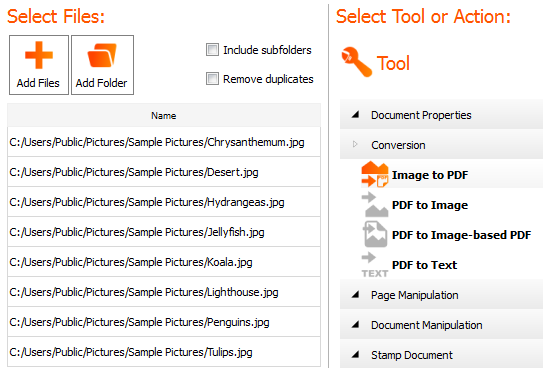 Actions in the Conversion group deal with converting images to PDF or PDF files to images. 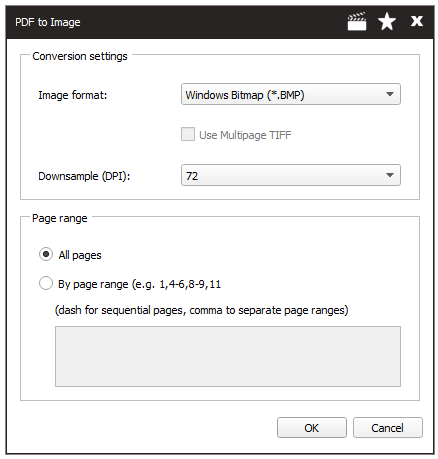 Convert images to PDF files. Each image is converted into its own PDF and can then be merged into one PDF using the Merge PDF Action. All pages in a multi-page TIFF image are converted into one PDF. Supported image types are BMP, TIFF, JPEG, PNG, GIF, WMF and EMF. The page range above would convert pages 1, 4, 5, 6, 9, 10, 11, 12, 13, 14, 15 and 21. Supported image types are BMP, TIFF, JPEG, PNG, GIF, WMF and EMF. Converts a regular PDF to an image-based PDF. Behind the scenes the regular PDF is converted to an image and then the image is converted back to a PDF. The end result is that the PDF is wiped clean of any hidden information, links, bookmarks or text that can be selected, edited or searched. The PDF must be OCR’d before the text can be selected or searched again. This Tool was added after we heard stories from lawyers who were being instructed to print PDFs to physical paper and then scan the paper back to PDF before distributing the documents outside the law firms. We decided to save them some time and money by adding this Action.